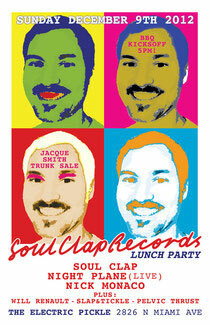 Soul Clap Records arrives with Impact, a new label, at Electric Pickle in Miami during the Art Basel festivities. Soul Clap line up their new roster of talent from the label including the indie-house talent of Night Plane (live) and scratch master Nick Monaco for 12 hours of festivity. Night Plane AKA William Rauschner is behind the debut release on Soul Clap Records, out now, and Monaco is scheduled for the second - coming early 2013. It all kicks off on Sunday 9th December at 5pm with an outdoor music and BBQ jam. As the sun sets, Night Plane takes to the stage, musically twisting and turning live and direct, before the party moves inside to the break of dawn with Soul Clap and Nick Monaco. "Dont be a square, be there... and we promise to be good to your earhole," says Soul Clap AKA Charles Levine and Eli Goldstein.